Markus Leibold, account manager of Bergader and regional sales manager for Minebea Intec, a leading manufacturer of weighing and inspection solutions and supplier of the new system for the inspection of heat-sealed joints says "As far as I know there is no other food production plant in the world that uses a hyperspectral imaging system to inspect the heat-sealed joint on the packaging, thus providing 100% certainty that every single cheese package meets the requirements for air-tightness". Markus Leibold and the development team from Minebea Intec from Aachen were present right from the start when Bergader began to consider a fully automated solution for the inspection of heat-sealed joints at its headquarters in Waging am See, Bavaria. The correct manufacture of such a heat-sealed joint is important because the calculated "best-before date" of the foodstuffs can only be accurate if the packaging is absolutely airtight. Even the tiniest contamination or damage can lead to leaking packaging and thus to the perishing of the foodstuffs. The possible consequences are unsaleable products or even recalls. The inspection of the heat-sealed joints was made more difficult by a stipulation from Bergader's Marketing department: that the packaging should be completely printed on the top side. It soon became clear that for this reason, conventional vision systems in the visible light spectrum couldn't be used and that ultimately the only choice remaining would be a manual inspection with all of its disadvantages. The cheese packages run from the left through the hyperspectral system and the directly following X-ray system for inspection. In the background, error-free packages are transported for further processing. In order to eliminate the risks mentioned, Manuel Pichler, who is responsible for the technical planning of a new production line at Bergader, began to search for suitable technology with Markus Leibold and the development team from Minebea Intec in Aachen. They initially settled on an X-ray system, which had already been planned in this plant for the detection of all kinds of foreign bodies. "However, with this system we couldn't detect faults in the heat-sealed joints with 100% reliability", Leibold says. At this point Torsten Schmitz, head of X-ray inspection at Minebea Intec, recalled a training course held by STEMMER IMAGING on hyperspectral analysis and contacted the machine vision specialists to see if they could help. The combination of all the imaging components for both systems in this plant was perfect from the very first proposal and met our requirements immediately. "During a discussion on the requirements for the new plant at Bergader, Jörg Schmitz, sales specialist to the food industry at STEMMER IMAGING, suggested testing the inspection of the heat-sealed joints on-site using this technology", says Leibold, describing the next step towards the successful solution. Together with STEMMER IMAGING the development team in Aachen then conceived the first system for the inspection of the heat-sealed joints on the basis of hyperspectral analysis. On-site tests took place just a short while later using a vision system based on an FX17 hyperspectral camera from the Finnish manufacturer Specim, which is distributed through STEMMER IMAGING. "The results were very promising from the very beginning and quickly confirmed that this technology is perfectly suited to this application", says Bergader engineer Pichler. The particular strength of these hyperspectral systems – called HSI in short for Hyperspectral Imaging – is their spectral resolution: with the aid of the transmission properties of long-wave light, contamination of the heat-sealed joint by cheese crumbs or other foreign bodies can be reliably detected even through printed plastic films. The prerequisite for this is that the covering plastic material is transparent to light in the SWIR range. The heat-sealed joint inspection at Bergader thus represents a perfect application case: imperfections or undesirable substances are reliably identified through the sealing film. The final version of the system features not only the Specim FX17 hyperspectral camera, but also the Xtium-CL MX4 digital frame grabber from Teledyne DALSA, which is used to capture the HSI images. Halogen line lighting provides the necessary wavelengths with a sufficient brightness to ensure that the Specim FX17 can capture its 12-bit grey level images to the required quality. The camera system including the line lighting is protected by a stainless steel housing that is open to the conveyor belt below. The spectral images captured in this manner are initially transferred to an industrial PC, where they are pre-processed on the GPU by the Perception Studio hyperspectral software from Perception Park. The CVB GigE Server, a module of the Common Vision Blox (CVB) imaging library from STEMMER IMAGING, subsequently feeds the pre-processed data to the Sherlock evaluation software from Teledyne DALSA, where further processing takes place. The vision system is modularly constructed, as Sherlock can take in camera images asynchronously and use CPUs with several cores. 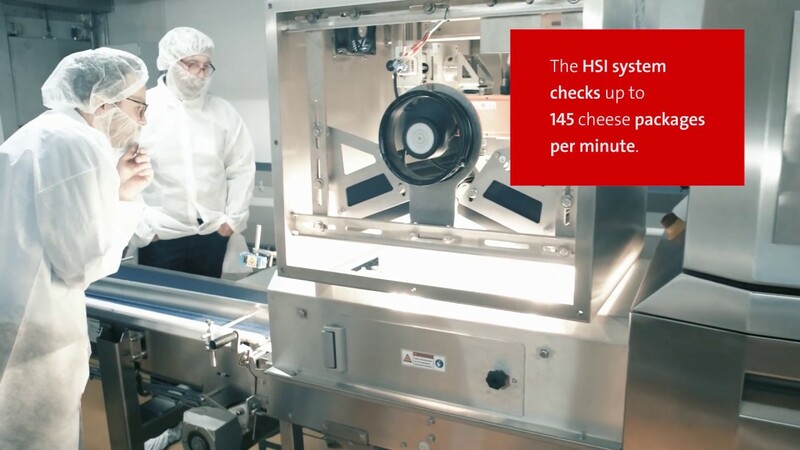 The HSI system checks up to 145 cheese packages per minute to ascertain whether the heat-sealed joints are correct. Sherlock is also used in another place in the complete system, as Jörg Schmitz explains: "Downstream of the heat-sealed joint inspection there is an X-ray system for the detection of all kinds of foreign bodies and directly following that there is a further vision system which reads the labels applied to each cheese package. Sherlock detects the "best-before date" printed there as well as an ID integrated in the label." For the capturing of images in this part of the system, STEMMER IMAGING recommended a compact, monochrome Teledyne DALSA Linea line scan camera with Gigabit Ethernet interface, a Fujinon lens with Midopt filters, a red bar light and an Adlink frame grabber to the developers from Bergader and Minebea Intec. On account of the harsh environment the camera is installed in a protective camera housing and the lighting is also accommodated in its own housing due to the prevailing conditions. Both protective housings carry the FDA approval, which is important in the food industry. Manuel Pichler (Privatkäserei Bergader), Markus Leibold (Minebea Intec) und Jörg Schmitz (STEMMER IMAGING) (v.l.n.r.) begutachten die Ergebnisse der Qualitätstests. Manuel Pichler and Markus Leibold are more than happy with the support received from STEMMER IMAGING: "The combination of all the imaging components for both systems in this plant was perfect from the very first proposal and met our requirements immediately. We were also in close contact during the further planning of the systems and were supported very efficiently by STEMMER IMAGING's Support Department", says Pichler. Markus Leibold is particularly proud of the heat-sealed joint inspection on the basis of hyperspectral technology: "This system, which is unique to date, represented the perfect solution for our requirements. With it we have been able to achieve the desired cycle speed of around 145 inspections per minute and attain virtually 100% reliability in the detection of heat-sealed joint faults." Hence, there is no longer anything to stop the enjoyment of the Bergader blue cheese packed on this system. Minebea Intec, formerly known as Sartorius Intec, is a leading manufacturer of industrial weighing and inspection technologies. Headquartered in Hamburg, Germany, the company offers products and services that have stood for innovation, performance and reliability for around 150 years. The product range includes among other things high-resolution platform scales, load cells, container and silo scales, check weighers, metal detectors, X-ray inspection systems and intuitive software solutions. Do you have any questions on this topic? Please feel free to contact me! This system, which is unique to date, represented the perfect solution for our requirements. With it we have been able to achieve the desired cycle speed of around 145 inspections per minute and attain virtually 100% reliability in the detection of heat-sealed joint faults. Markus Leibold, Gebietsverkaufsleiter, Minebea Intec.